If spatial sampling is an efficient way of capturing knowledge of spatial variation, then there must be reliable ways of filling in the unknown variation between sample points. Spatial interpolation attempts to do this, by providing a method of estimating the value of a field anywhere from a limited number of sample points. Spatial interpolation is no more and no less than intelligent guesswork, supported by Tobler’s First Law. For example, in Figure 2‑10, below, we may wish to estimate the value at location (5,5) utilizing knowledge of the values of nearby locations. In this example a total of 5 nearby points have been selected and the value at location (5,5) will be estimated as some combination of the known values at other locations, for example as a weighted average of these values. Typically weights are chosen to be larger for nearby values (e.g. 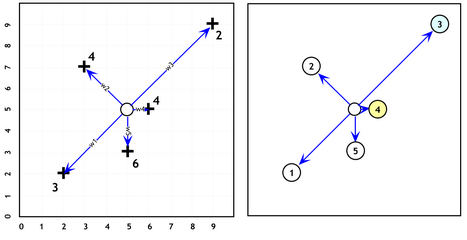 point 4, with value 4 and point 5 with value 6) than more distant sites, such as location 2 with value 4. For example, weights could be chosen as a simple inverse function of the distance between the point to be evaluated and the measured locations – the further away a known location is the less its contribution (or weight) will be to the estimated value at (5,5). For the example shown this yields an estimated value of 4.18 at location (5,5), with point 4 contributing 44% to this estimate, whilst point 3 contributes only 8%. Many methods of spatial interpolation exist, all of them based to some extent on the principle that conditions vary smoothly over the Earth’s surface. Methods have even been devised to cope with exceptions to Tobler’s First Law, by recognizing the discontinuities that exist in some geographic phenomena, such as faults in geologic structures, or the barriers to human interaction created by international boundaries. Arguably the most rigorous approach to interpolation is Kriging, a family of techniques based on the theory of geostatistics (Isaaks and Srivastava, 1989). Kriging and a wide range of other interpolation methods are described in Chapter 6 (Surface and Field Analysis) of this Guide.